It felt like I’d been walking for years. My feet were swollen and the same trees seemed to pass again and again, becoming a dull blur of green broken by the occasional swath of brown. I didn’t know where we were going, honestly, I didn’t care. There was always another lord to fight, and another castle to sack. To my surprise, since that day in training more than a year ago, I’d grown rather fond of my mates in the siege team, and we’d bonded over countless nights of beer and cannon blasts. We’d poured out a few, for a few, over the past year but we didn’t seem to have the same bad luck as the men in the infantry. Nor that unlucky lad I’d nearly choked out during training. His name was Kiran and we’d grown up in similar situations. He was orphaned at a young age when his father died fighting for the last lord and his mother passed shortly after. I had found a true brother-in-arms and I felt, for the first time in my life, content. Happy even, but at the moment dead tired and sick of the endless marching. Thankfully, we seemed to be slowing down. Looking out and over the shoulder of the man in front of me, I tried to see what was going on, but all I saw was the long line of men-at-arms in front of him, and dense trees further ahead. That's when I heard an all too familiar “boom” in the distance. We continued slowly marching forward, as the ‘booms’ got steadily louder. Moving through the tree line we entered a broad plain full of fighting men that slowly sloped down to an impressive fortress. On another day, in another time, all those knights and colorful banners might have been a beautiful, wondrous sight, but at this time, on this day, it was covered in weapons, dead and dying men, horses, siege towers, and all manner of detritus. Steel clanged, arrows whistled, cannons boomed, men screamed, it was a gloriously terrifying tableau. The Captain roared at us to take our position with the other cannons, just outside the range of the fortresses archers, and we followed the horses that pulled them into position. Dropping the trail that steadied our cannon, we pounded the spikes into the ground that would hold it in place, and then we started loading it. It was all a routine now, if not for the foul odors in the air and the screaming all around, I might’ve forgotten there was even a battle going on. Circling around behind the cannon, I adjusted the elevation towards the top of the wall. Priming it, it shortly delivered a thunderous roar as it expelled the heavy iron ball skyward. Kiran’s gaze followed its trajectory as it climbed towards the battlement above the main gate, and then he gave a holler as it smashed through the very top of the battlement, destroying several merlons, and archers, in the process. “You see that? Woo! You’ve really got an eye for this, you know that?” I shrugged and grabbed another round to load into the muzzle. As we harnessed the horse to the cannon, what was left of the infantry and cavalry were already turned and headed away from the fortress, while abandoned siege towers and battering rams had been set ablaze and left by the walls. Lines of men and horses were already headed for the tree line at the rear. “Mount up, we don’t have much time,” I said to him as he swung himself up and onto the horse. “Ok, easy now…careful…” The horse dug into the blood-streaked mud and strained as the cannon slowly righted itself. Undoing the harness I gave the scout a fierce look, “Great job, now ride ahead and clear a path for me, this is going to get messy.” The scout seemed unsure, but as his gaze turned from the cannon over to the enemy cavalry that were massed in the distance past the lines of men in retreat, he started grinning. 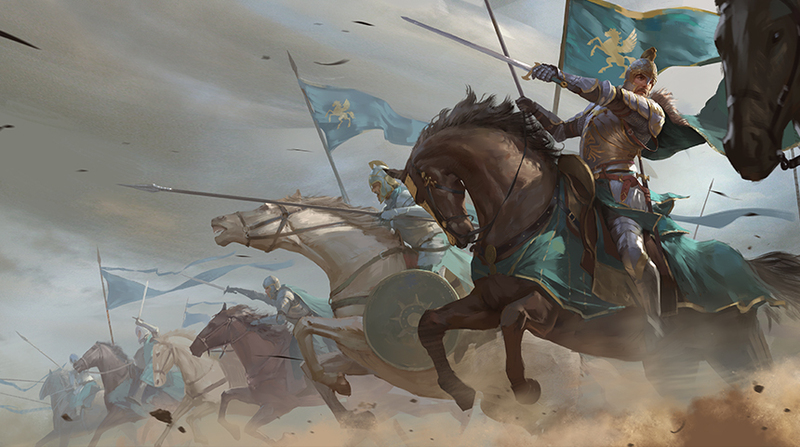 “You’re crazy.” Laughing, he yanked on the reins, and galloped straight at the lines of retreating men, waving and yelling at them to part and clear a path. Slowly, I could see a clear line of sight opening, which ended with a mass of mounted enemy knights. I heaved an iron ball into the muzzle as I’d done a thousand times before, then packed and primed it. I stared down the barrel as I lowered the elevating screw a few turns, until the barrel was about parallel to the ground. Satisfied, I took a moment to look to my right, where not far away I could see the remains of Kiran and my cannon. I whispered “This one’s for you brother,” as I touched the flame to primer, and it boomed ferociously in reply, sending a cannon ball streaking down between the two masses of men the scout had just parted, scattering them further to each side in fear and awe. Seconds later it tore through the middle of the massed cavalry, sending men and horses and blood and metal tumbling back towards the stone walls of their fortress. I ran around and loaded another, then packed it and primed it once more. This time the target was much clearer and the path much wider, as the infantry that had parted were now either running to each side or had dived to the ground. I bumped the cannon a bit to the left and then fired it, raising my arms and letting my roar mingle with its own as we both vented angrily. This next shot tore through the left flank, rending flesh from bone and men from horses. A cheer went up from the assembled infantry on both sides, as I packed another shot. I looked carefully for something meaningful to hit, something that would hurt them, like they had hurt me. That's when I saw the standard bearer next to what had to be some kind of commander, who was trying to regroup and rally his troops for a charge. I twisted the elevating screw down just a bit further and nudged the cannon back to the right a bit, and looking down the barrel I had a good sight on them both. Touching fire to primer it boomed once more, and a few seconds later they both vanished in a bloody mess. The infantry were now standing, cheering and hollering, and then without orders or organization they charged what was left of the cavalry, as our own charged the still open gate. I wanted to join them in joyous revelry, but there was too much pain inside, too much loss. I knew that on this day something inside me had changed, and that there was no going back. In the great hall the heat was stifling. Sun poured through the stained glass high above, throwing colors over the assembled nobility as if a rainbow had been shattered and scattered across the crowd. As the jewel encrusted sword came to rest briefly on each of my shoulders, I could hardly feel it. I listened to the words my lord spoke without hearing, and when prompted I stood and bowed crisply without thinking. They called me a hero, but I didn’t feel like one. I just felt lonely and mournful. I walked stiffly out of the brightly-colored hall with little but bittersweet memories, and the uncomfortable weight of the medal on my chest.